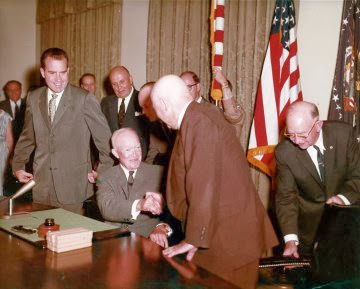 The federal territory of Alaska faced statehood on January 3, 1959 47 years after Arizona was allowed into the union. The formal entry into the nation proceeded the Hawaiian statehood proclamation by 7 months, due to the archipelago's popularity with US citizens. The aggressive marketing of Hawaii as an idyllic escape from the day to day troubles abound in the national mainland produced what Adria Imada describes as an "imagined intimacy" between white Americans and the islands. The nation's bond with Hawaii through this intimacy led political leaders to proudly make Hawaii the 50th state. They believed that the profitable but less popular Alaska Territory, with it's more rugged reputation as a frontier and unofficial moniker as "Seward's Folly," would be overshadowed by Hawaiian statehood. As the Cold War between Russia and the nation developed Alaska proved a strategic place in the Pacific to guard against the threat of spreading communism, thus lending the territorial government a degree of political sway with national leaders. Pledge of allegiance to the new 49-star U.S. flag. 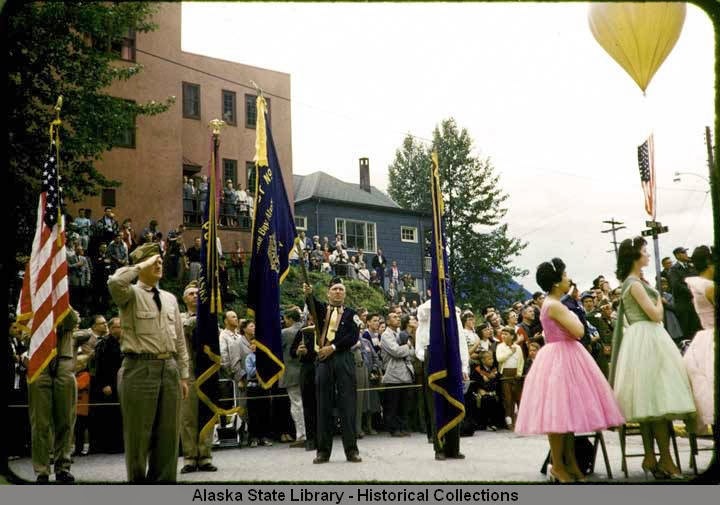 "Flag raising ceremony in front of Juneau Memorial Library; helium-filled balloons are released, carrying metal plates." Ann Pearson Wood Slide Collection, 1959. SL-P534-44c. 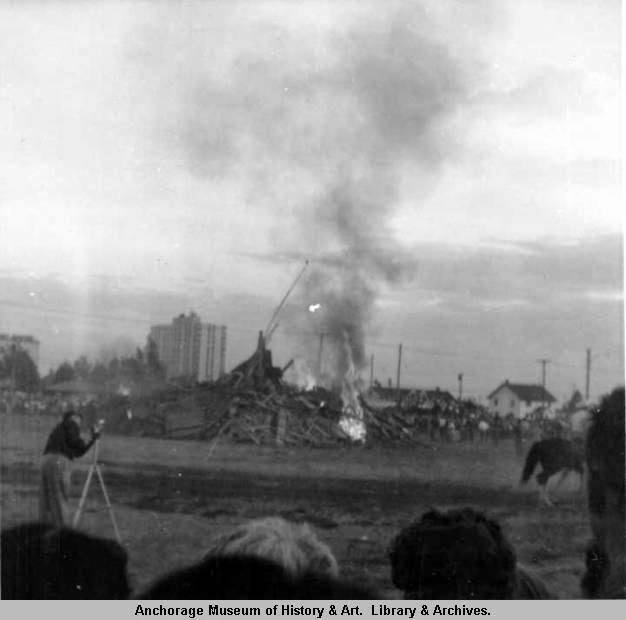 There were an estimated 34,000 Alaska Native people in the territory at the time, accounting for over a third of the entire population. Residents of the new state celebrated throughout the year. Below is a clip of a statehood parade taking place in the town of Nome. Native and non-Native alike took part in parades throughout new state. 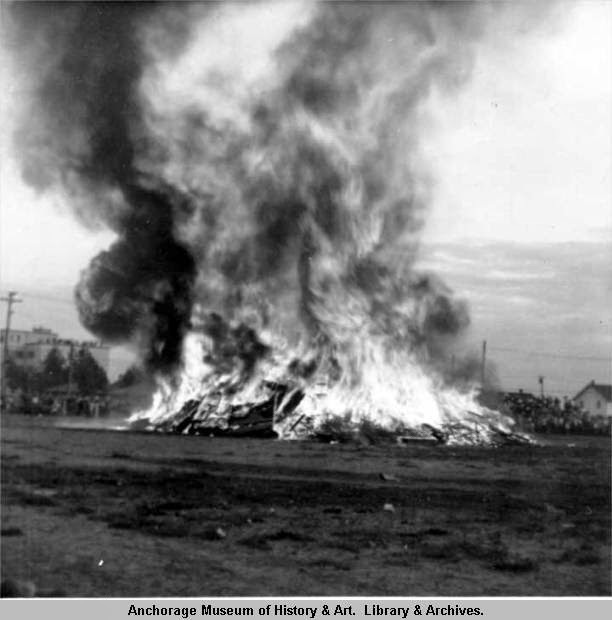 In the city of Anchorage, upon signing of the Statehood Act, residents set a blaze a giant bonfire along the Parkstrip. It's difficult to imagine the city allowing any person or organization to build such a giant fire downtown.